My first visit to Malta has been positively helped by Hotel Seabreeze located in Birzerbugga little gulf beach. I have been there from 09 till 14 August 2012. 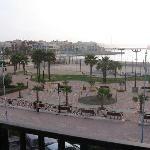 The Hotel position is very good on the promenade street looking at the little gulf of the place. My room 214 at second floor was perfectly clean double room used as single at a good price of 57 Euro per day with Continental breakfast and dinner. The air conditioning resulted perfect...outside 42°C at my arrival and 25°C in the room... The beach is with sands and has umbrella & chair service to be paid but where is also large space for free beach. The rooms looking at seaside are 4 on first floor and 4 at second floor. They are larger and all have a balcony with table and chairs. The restaurant offers many fish specialities but also Italian pastas and pizzas. The manager Mrs Rita is very friendly and reply inmediately to emails requests. From airport it is possible to book TAXI driver service for 16 Euros but there is also a direct bus service from Airport to Hotel stop RUGI at 50 meters from Hotel. Bus works with Airconditioned. In August is very hot in Malta, so a room with Frigo bar working is very important. I remained really pleased to have found a relatively cheap price, well managed and with friendly personnel. I will surely come back to Hotel Seabreeze. Other BUS is going to La Valletta Central Bus station so you may easily go/back from the capital city of Malta. I was browsing through the trip advisor and noticed a disappointing remark on the above mentioned hotel and restaurant. Last saturday i was aswell having a meal with my family at the seabreeze hotel and restaurant. I congratulate the staff for their hard work and the brilliant managment for their great job. Yes i understand that on such a day where the restaurant was jam packed we all had to be patient and wait for our food, but i can assure you that it was finger licking good. Unfortunately i was present during mr tyler c's complaint with the mentioned receptionist, and i can assure everyone who is reading this that she was never rude.she explained to him that it was a very busy evening and apologised for the cold food which he said he still ate and expected not to pay, finally he told her that he would never go back and being very diplomatic the receptionist told him politely that he is free not to come again if he wasn't satisfied with their service. In my opinion she was very diplomatic to a rude approach. Thumbs up to all at seabreeze hotel and well done for your excellent service. I would recommend this place 100%. I heard alot about the hotel since I live in Birzebbugia but let me just say that the service in the hotels restaurant was terrible. Waiters seemed arrogant. Food took very long to arrive and when finally it did they forgot to bring the proper plates and forgot to serve one of my friends. And, the food was cold. Now I completely understand that it was Birzebbugia's feast which means there will be alot of hassle in the restaurant but it doesn't mean I get my food cold. When finally decided to talk to the receptionist and told her about everything she was very rude and had an inappropriate tone of voice. Also told me to not come again... After telling her I was not happy with the service. Guess thats 1 place I am not going ever again and also letting people know about this service.